The private sector has led the way toward supporting, creating, and implementing peace in areas where there is limited government capacity according to panelists at a One Earth Future (OEF) led workshop at the annual Build Peace Conference. The event organized by Build Up, a social enterprise that amplifies citizen participation in peace, and hosted by the Universidad de los Andes, brought together a diverse range of international and Colombian experts in peacebuilding, including academics, activists, artists, and international non-profit organizations to explore new forms of citizen participation in peace agreements. The theme of the Build Peace conference was “making paper count: new forms of citizen participation in peace agreements”. The private sector often provides essential social services when the local or national government is unable. Drawing on their experiences in Somalia and Colombia, OEF staff discussed the ways that the private sector has contributed to peace. Victor Owuor, a research associate with OEF Research, discussed his research on business and the responsibility to protect; business associations; the Kenyan private sector; and firm behavior in fragile states. Owuor observed that large companies have influenced peaceful outcomes in Kenya and throughout East Africa. He highlighted the spectrum of activities the private sector had engaged in, including political violence insurance, sponsoring presidential debates, and blocking hate messages over messaging services. Tony Pelz, director of Shuraako, highlighted the program’s work in Somalia, emphasizing its role in job creation. Pelz noted that this activity indirectly contributes to peace in the communities that Shuraako operates. Creating economic opportunities helps to prevent people from engaging in illicit or criminal activity, said Pelz. Yezid Campos, associate director of Shared Resources, highlighted the need to reconstruct social networks in Colombia after the peace agreement to achieve an effective reconciliation process. For this to be possible, it is necessary that the private sector recognizes the need for peace and finds ways to help fulfil different points of the agreement. For this to happen, the private sector must realize its responsibility to uphold human rights. Additionally, clear roles must be established for the private sector and all other stakeholders involved in the peace process. The panel was quick to acknowledge the risks and challenges associated with the private sector of peace. For example, the private sector can also profit from violence or gain too much power in politics. The OEF workshop demonstrates that the private sector is important to peacebuilding but often overlooked. It posited that understanding how the private sector can contribute to peace is important to shape its future involvement. Individuals and organizations present at the workshop incorporated lessons for their work. 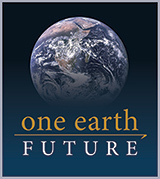 OEF Research is One Earth Future’s think-tank program. Their work is built around the goal of supporting evidence-informed practice in peace and security, with a focus on questions of good governance and the role that non-state actors play in governance and peace. OEF Research believes that policy and practice reflect the quality of available information. They promote empirically-informed research developed using methodologically rigorous approaches as a tool for policy making in peace, security, and good governance and believe in analyzing evidence using both quantitative and qualitative best practices. One Earth Future's Shuraako program (Shuraako meaning “partnership” in Somali) connects investors with promising Somali-based businesses to encourage economic development and stability throughout the country. Shuraako’s work drives economic development, expands local markets for goods and services, creates jobs and encourages investment and trade. Shuraako believes strengthening local businesses fuels greater economic growth and bolsters social welfare which are both key to rebuilding Somalia and fostering long-term stability and peace.